The tie was already over at this point, so perhaps some of the competitiveness had gone, however this goal shows some of the benefits that depth can provide when moving the ball forward. Much like Philippe Coutinho’s goal against Villarreal at the start of the month, the move starts with Barcelona in possession but with their opposition well-organised in defence, so they play backwards to bait the press. Manchester United take the bait and move up, with Barcelona going all the way back to the goalkeeper. 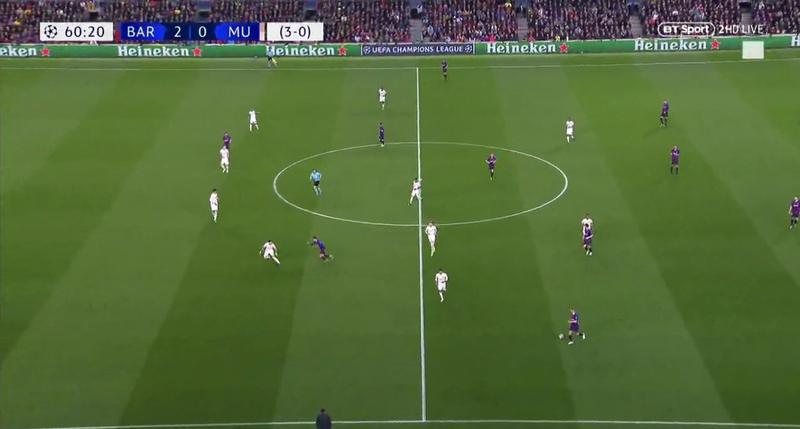 This pressure is generally a waste of time though: Barcelona have four players back around the box while United push just two men forward. 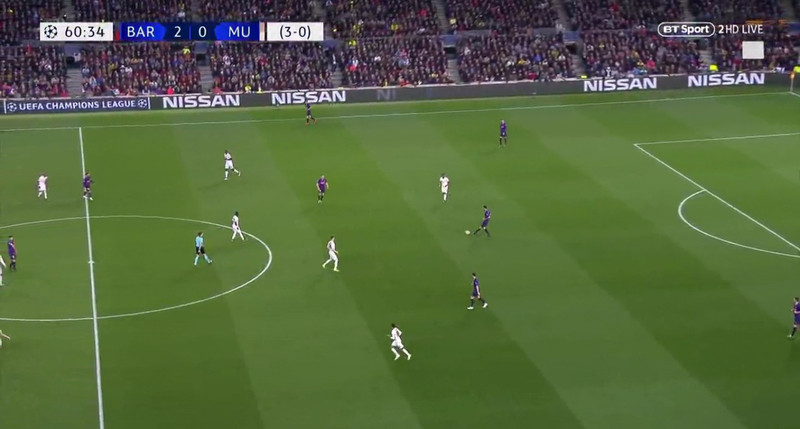 Marcus Rashford goes to close down Marc-Andre ter Stegen in possession, but fails to block the pass into either of Clement Lenglet or Sergio Busquets behind him, while Anthony Martial positions himself between Busquets and Gerard Pique. 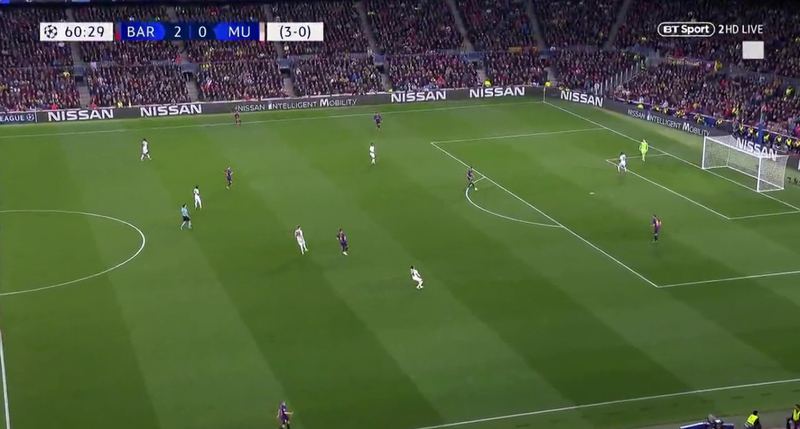 Ter Stegen isn’t bothered by Rashford’s pressure and rolls the ball out to Busquets, who turns and pushes forward on the ball. 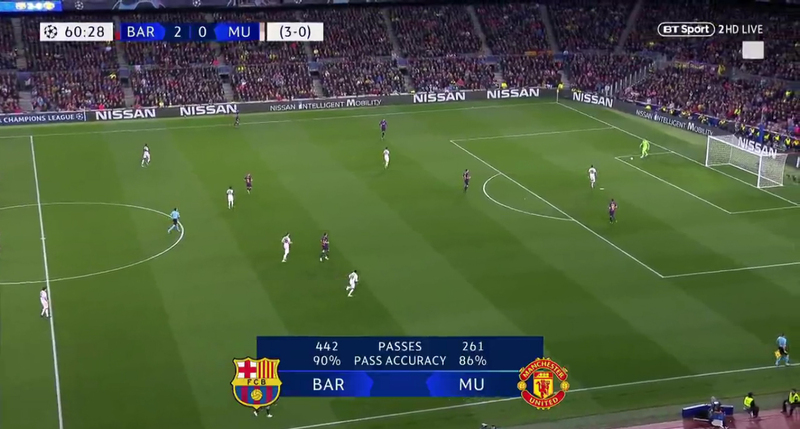 Martial’s positioning had presumably been to discourage the pass into both Pique and Busquets, but he doesn’t bother to close Busquets down when he receives the pass. United’s press has immediately been broken and they begin to drop off. Fred and Scott McTominay got tight to Ivan Rakitic and Arthur Melo in midfield for the press, but now with the press broken they are more concerned with what’s behind them. Fred leaves Arthur free to be in a position to stop Lionel Messi cutting inside if he receives the ball, so while Busquets has a pass open to Messi, he instead opts to simply knock it into the feet of Arthur as the number ten has Ashley Young breathing down his neck and Fred on hand to defend. 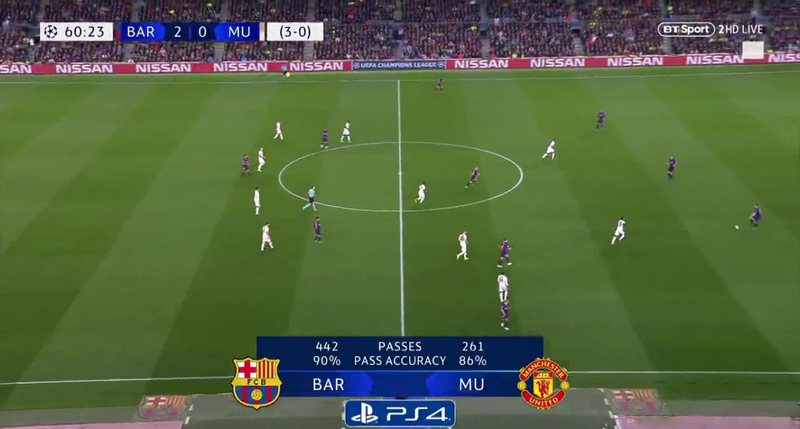 The same problem arises for Arthur: he is under no pressure, but the only forward pass open to him is into Messi, who’s being followed by Young and covered by Fred. Barcelona have time and space but it’s in deep areas rather than where they can score. Messi and Jordi Alba combine to solve the issue. First of all, Messi comes deeper to pick up the ball. 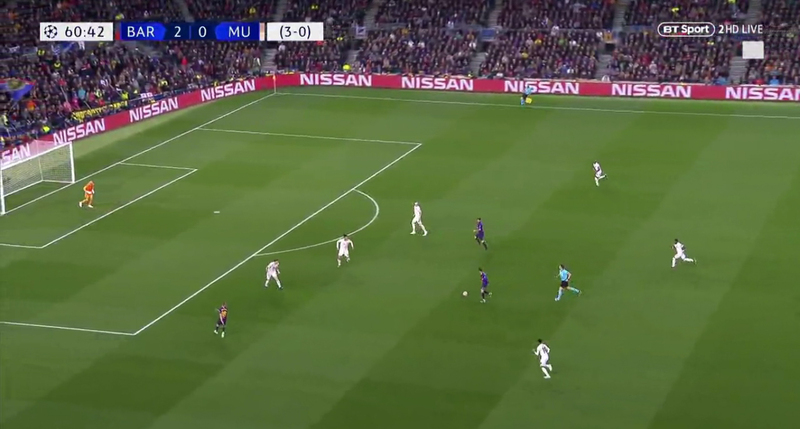 Young is unwilling to follow him that far and while Fred doesn’t get too close to him, he stops backing off, not wanting to cede too much space in case Messi decides he wants to dribble forward. Messi doesn’t. Coutinho tucking inside has brought Victor Lindelof with him and Alba pushes forward into the space that’s opened up out wide. 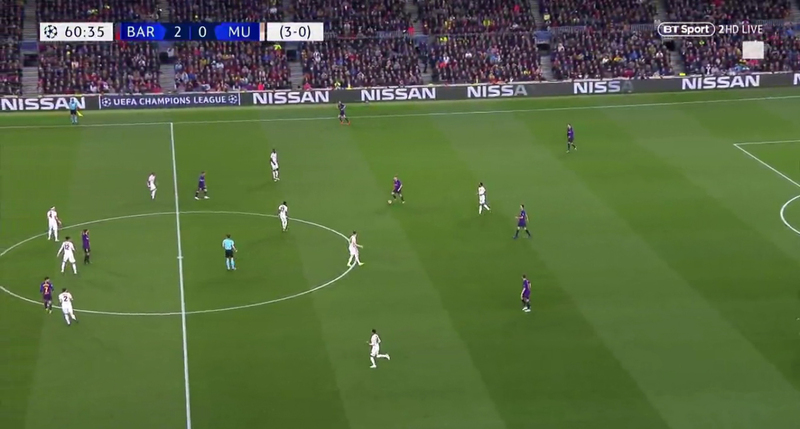 Messi picks out a ball over the top for Alba to run onto, forcing United’s backline to drop off. 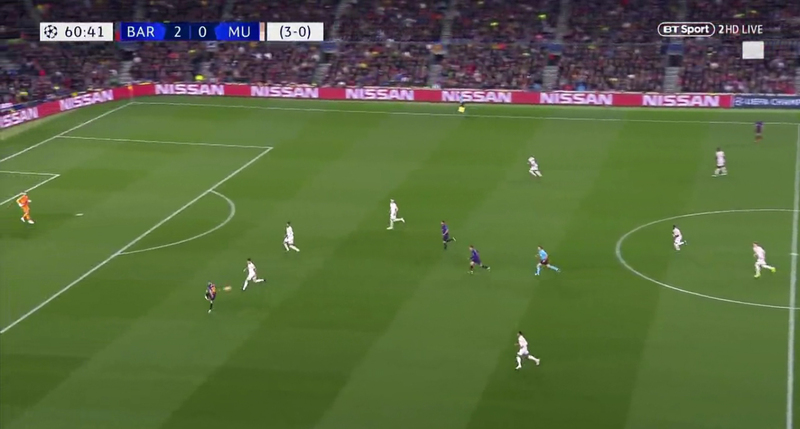 Alba doesn’t attempt to attack though, instead laying off the ball to Coutinho, who, with the United backline dropping off and Fred unable to scramble back in time, has the time and space to dip a shot into the top corner.